Concerns over the economy and fiscal deficit and the need to tighten the government's purse strings were underscored at the first full meeting of the Union Council of Ministers here, with Prime Minister Manmohan Singh utilising the opportunity to remind his Cabinet colleagues to farm out work to the younger ministers. 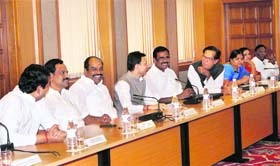 Ministers during their meeting with PM Manmohan Singh in New Delhi on Thursday. 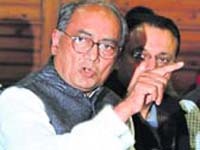 AICC general secretary Digvijay Singh today accused Arvind Kejriwal, yoga guru Ramdev and other civil society crusaders of not pursuing charges against Nitin Gadkari. He said their studied silence on the issue confirmed his charge that they were working in tandem with the BJP. Less than a month after Punjab Deputy Chief Minister Sukhbir Singh Badal�s Rs 1 crore donation to his alma mater Lawrence School Sanawar came under the lens of the Punjab and Haryana High Court, the state government today virtually conceded that the grant was not strictly within the ambit of the �Punjab Nirman Programme�. The UPA government today acceded to the demands of NGOs and social activists and formally withdrew the proposed amendments to the Right to Information Act. The decision was taken at the Union Cabinet meeting today chaired by Prime Minister Manmohan Singh. Anticipating resentment over constant increase in fuel prices, the government late on Thursday night put on hold the Rs 26.50 increase in price of cooking gas cylinders that consumers buy beyond their quota of six subsidised cylinders. The Duchess of Cornwall�s current visit to India is a reminder of the British royal family�s interest in India going back over 100 years. Camilla is neither the most glamorous nor the first Princess of Wales (she deliberately abstains from using the title out of respect for her predecessor, Princess Diana) to travel to the subcontinent, but she has been a more regular visitor than the unhappy Diana who in 1992 was famously photographed alone and forlorn against the backdrop of the Taj Mahal. 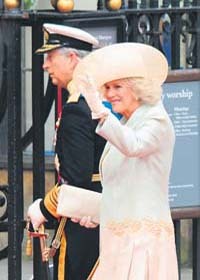 A file photo of Duchess of Cornwall Camilla with her husband Prince Charles.